Caption: The photo above is of a Batasio havmolleri, a species of Bagrid catfish found in Thailand, and is *not* the Batasio macronotus found in Nepal. EMPORIA, Kan. - An Emporia State University professor has discovered a new species of catfish - a find made official when it was published in the December issue of a scientific journal. Professor David Edds found the catfish, called batasio macronotus, in Nepal after collecting specimens in 1984 and 1996, but those had to be compared with known species, a labor-intensive job. His discovery was published in the Ichthyological Exploration of Freshwaters. The 4- to 5-inch batasio macronotus (macro means long and otus means back) has an unusually long adipose fin, a short dorsal spin and thick tail region. Edds' fish collections number in the thousands. According to Emporia State's Web site, the fish are kept at the Fisheries Development Division in Kathmandu, Nepal, at Tribhuvan University in Kathmandu, and at Oklahoma State University and the University of Kansas. Heok Hee Ng, a University of Michigan researcher and expert on Asian fishes, helped with the discovery of batasio macronotus and co-wrote the article about the previously unidentified catfish. "He recognized that this is something different," Edds said of the University of Michigan researcher. "He was generous enough to include me as a co-author." The pair also has submitted an article for review describing two other new species of fish and is working on another manuscript about two more discoveries. 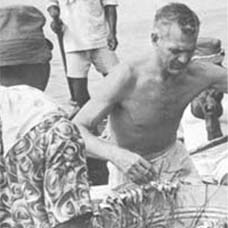 Edds became interested in fish as an undergraduate at the University of Kansas, then joined the Peace Corps, which sent him to Nepal, where a thorough survey of fish had never been done. "The ecological differences are really striking, leading to animals that are really striking," Edds said. Edds returned to Nepal while doing graduate work at Oklahoma State in 1984, and again in 1996 while on sabbatical from Emporia State. "The thrill is there, to discover new things and to describe new things previously unknown for science," Edds said. "I think one of the significant parts of it for me is, this is one of the places of the world where we are losing biodiversity faster than we are describing it." Edds hopes to return to Nepal, but the country is in a civil war. Rebels in Nepal have been fighting since February 1996 to replace the monarchy with a communist state. The insurgency has claimed more than 10,000 lives.